Google has updated the Google Currents application to v2.0, which brings with it some really nice changes. First of all, the UI has been changed and looks nothing like the previous version. It now has more in common with some of the other recent Google Android apps, such as YouTube and Google+. The application features a new editions list that can be accessed from swiping from the left side of the screen. You see all your categories and the selected sources within. You can customize this list by adding or removing the sources. Select a source and you’ll see that the articles appear as large thumbnails that span the width of the display, just like in the YouTube or the Google+ app. While scrolling you’ll get that lovely flowing tiles animation you see on the Google+ app. Click on one and you’ll see a similar side-scrolling UI as in the previous version of the app. Go all the way to the right and then you can advance to the next post. You can also star an article for viewing it later. Once you view an article, the thumbnail grays out, which is a nice touch. You can choose to have it removed from the list entirely as well. I couldn’t find a way to mark an article as unread, however, in case I accidentally opened it. * Edition sidebar – quickly access your editions within categories such as business, sports, etc. * Breaking stories – ranked by Google News. Links to full length content. 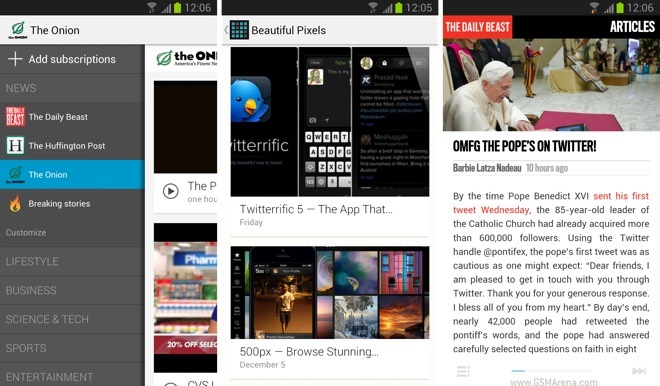 To download the new Google Currents app for Android, click here.